Great innovative idea! How can I obtain a shovel for a non profit project here in mid- TN ? @cloneboy @reaize1234 @zer0pro @Secruss @11010101000100100 I want to start off by saying that you are all correct in thinking that this project did little to physically change the violent state of Culiacán. With a population of 675,773 people, 1527 guns no longer in circulation doesn\'t really make too much of a difference... HOWEVER, mentally speaking you guys couldn\'t be more oblivious to what is actually going on. All of you need to remember that Pedro Reyes is a community artist not a wizard. He didn\'t start this project with the goal of completely ending Culiacán\'s gun violence conflict by having civilians donate their firearms, he did it to bring attention to the topic at hand. The more people know about what\'s happening the better of a chance they might stop and think, \"hey...there is actually something going on here that needs to stop.\" Reyes was not only successful in spreading this idea throughout Culiacán, but his so called \"useless\" shovels were also sent to Mexico City, Vancouver, San Francisco, and Paris to plant trees in order to bring light to the topic of gun violence. A gun-less, weaponless, non-violent society is the mindset of a utopian idealist that seems almost un-achievable, but spreading the word on problems that are actually going on is definitely a step in the right direction. Haven\'t you guys ever heard the saying, \"an eye for an eye makes the whole world blind?\"
@LogicalThinker You haven't actually looked at statistics about this kind of thing, have you? Before you call people ignorant you may want to educate yourself first. Melt the weapons of war and turn them into shovels of peace. Shovels of peace that will have to be used bury these people after criminals killed them, raped their families and burned their houses down. You might be dead as a dodo but look at the bright side: at least you disarmed yourself! Yeah, give civilians trees and shovels. That'll scare the cartels off. Well now they have plenty of shovels to bury their dead. LogicalThinker says "...guns for protection is not a good idea..." Tell that to the many people who have successfully used them to defend themselves and loved ones against predators. What a waste of good steel. How about we melt down some criminals for a change. those that beat there guns into plowshares will plow for those that have not. Thing is that citys like Chicago and DC that don\'t have concealed carry have HIGHER violent rates than cities of similar or larger populations. What are youy gonna do if someone I\'d entering your house to do harm to you or your family...call 911 and wait for the police to get their. It is not slow or incompetent police but just the simple fact that they can NOT be everywhere at once. Yall call 911 I\'m gonna blow their friggin head off and turn their brain matter into a pink mist. If soeone breaks into your house to harm your family call me. Ill protect you too. Alright! Now only the criminals have guns and a new unarmed source of electronics. Guess the newly unarmed can defend themselves with trees or sticks. Let\'s be realistic. As soon as those shovels were done, they were distributed to citizens by the drug cartels so that they could dig their own graves. You criticize cloneboy, but a citizen CAN NOT make a stand when they are on their knees in front of a government riddled with corruption and drug gangs that see them as nothing more than a human shield. @Cloneboy - I\'m sorry, but... That\'s about the most ignorant thing I\'ve read in a LONG time. Guns are the problem, not the solution. The reality is that gun violence is greatest in the countries that have the most guns. Does that mean I think we in the US should not have access to guns, that\'s a tough one. My first answer would be that I don\'t think it\'s a good idea to take away any rights, however... If you do the research, you\'ll find that the greatest contributor to gun violence is having access to them. The US has one of the HIGHEST rates of violent crime of any industrialized nation in the world! 500% higher than most of Europe and 1,000% higher than most of Asia! The cases of gun use EVER \"protecting\" anyone are extraordinarily low. Are there cases though of that? Of course there are. But you can NOT use the exceptions as the rule. The reality is more guns lead to more likelihood of violent crimes - not less. Period. If you really think about it, do you think MORE guns floating around would lead to LESS crime? Really? We are a gun totting country, it\'s part of our history, and part of our culture. I\'m not sure however they are a good idea for our future though... or for anywhere. For the record I grew up around guns. I have family members who were and some who still are in the military. I grew up in a small town where hunting was the norm, people riding around in trucks with riffles on their racks was a norm, not an exception. So, I assure you... I\'m VERY aware the likelihood of guns not being a part of our country any time soon is slim to none. I\'m also aware of the countless people here who have guns for sport hunting, and I think that\'s fine. I do think however, guns for protection is not a good idea and... That\'s NOT just an opinion - the facts and evidence support that. This is awesome ! Even if the most well intentioned people gave away their weapons, you cannot fight crime with violence. Those that hold weapons for protection are just putting themselves and their families in danger. In addition to this I don’t think your average folk hold the 40% of them which were automatics of military caliber. This symbolic act is not only great for the environment it is also a communal condemnation of crime and violence. Thousands of people that took a direct action to make their community more peaceful. You're right cloneboy, it isn't enough to melt guns into shovels. It takes one more thing - mindset. This guy has it. He's helping the community build it. You, unfortunately, are just one of those people who need a weapon to hide behind rather than taking a positive stand and actually contributing something positive. What this guy does may not make a huge difference, but it's better than what you have to offer. @cloneboy You sir, are an idiot. ugh. This is so stupid. All these gun turn ins do is disarm the honest of the populace. Those that beat their swords into plowshares will plow for those that do not. Do you really think someone inclined to shoot up the neighborhood is going to turn in their weapons for a gift certificate? Or even if they do, that they won't go out to get another one? 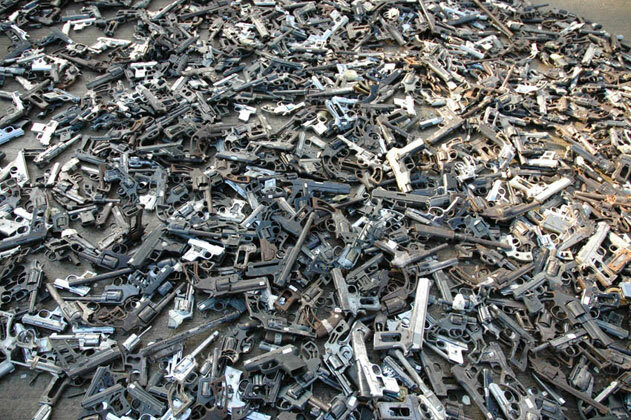 Also, some of the guns in that pile are made of polymers, high density plastics. I bet the high heat required to melt down the metals in those guns would\'ve done a great job at turning those into noxious fumes. The city of Culiacán, in western Mexico has the highest rate of gun deaths in the country. After speaking with family members of victims of drug crimes in the city, artist Pedro Reyes decided to use its prolific amount of firearms to help the local botanical garden. In the ultimate act of recycling, Reyes and the garden started a campaign for residents to hand over their guns to the artist in exchange for a coupon that they could use to buy electronics or household appliances. 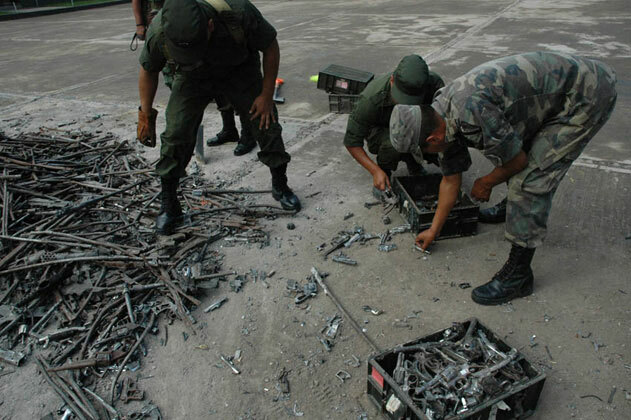 He collected 1,527 guns for the project -- Palas por Pistolas -- had them melted down and transformed into 1,527 shovel heads that are now being used to plant trees in the community.